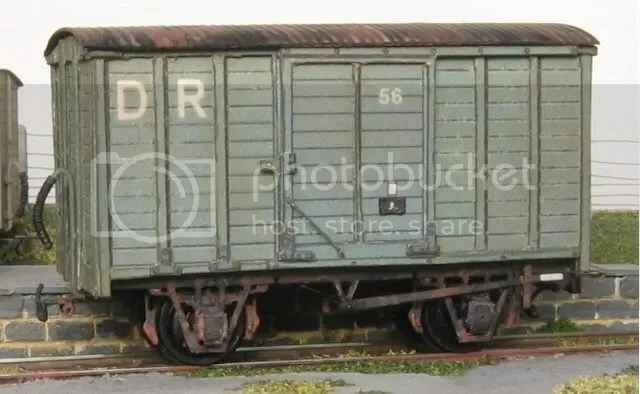 Maybe surprisingly there are two kits available for the County Donegal Railways 1893 Oldbury vans in 4mm scale. One is the ‘heritage’ plastic kit by Ninelines, introduced around 1989, the other a card kit by Alphagraphix from around 2002. I’d built the Ninelines kit many years ago when I had first started in 00n3. Very straightforward as you would expect and it is a shame that with the demise of Ninelines it may no longer be available. I was fortunate to acquire the card kit for this van as I wanted to use it for the Inscalemodels brass chassis kit designed for this van (and as a replacement for the basic Ninelines chassis).Care is needed in cutting out the parts for the card kit. I find the corners of the framing the most challenging. I followed the instructions provided. In 4mm scale I would not advise any backing of the timber framing with scrap card, everything seems to fit well without. The painting of the card edge can also be tricky. I used Humbrol enamel paint, applied along the edge, from the back, with a fine brush. It would be helpful to have a suggestion of suitable paint colour to use in the instructions as I’m very poor at colour mixing. With a range of greys in front of me I eventually opted for Humbrol Slate Grey, No 31, which seems a near match for this kit. Other kits will vary. I’d already soldered together the frames, etc provided by Inscalemodels. They needed shortening a little at each end to fit the van body. I backed them with balsa wood so that they could be stuck to the mount board that formed the floor of the van. The masters of brass out there would do a more professional job I’m sure. I finished the chassis using 10.5mm diameter wheels from Alan Gibson. The roof is made from corrugated plastic-card glued to a balsa former and is removable. The vacuum pipes were completed with brass wire, wrapped around with iron wire for the hose, acceptable at a glance. A brass pin soldered to the pipe fits through a hole drilled into the end of the van and, glued from the inside, will hopefully hold the pipe in place without causing damage to the card if it gets knocked. Shunting at Lispole... now how did two CDR vans get this far? The Alphagraphix card kit takes much longer to produce and I’ll let the reader judge whether it’s been worthwhile! I find building three card kits a year is enough, though there is something addictive about them and they definitely should not be discounted. I’m currently building the CDR bogie wagon by Alphagraphix, and there is that wonderful combination of a card kit with soldering to tax one’s skills! Whilst these models are not built to fine-scale standards, and certainly not to a professional level, they do reasonably represent the classes modelled. 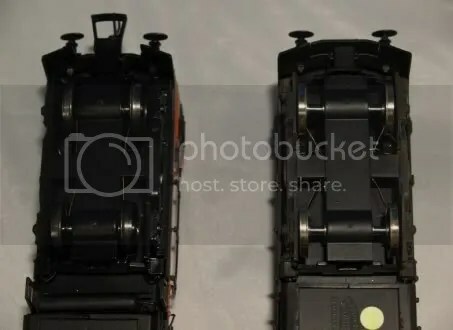 In any case, using 00-gauge track at in 4mm scale gives much larger discrepancies than slightly inaccurate driving wheel diameters or axle spacing. The WT-class 2-6-4Ts Nos. 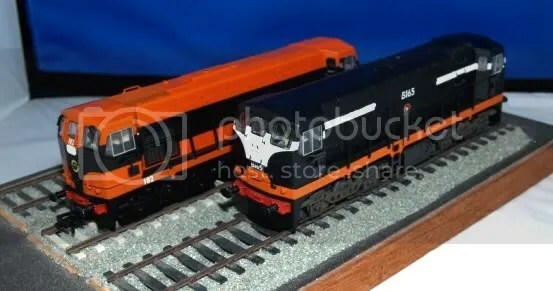 4 and 57 are Hornby Stanier locos, modified with Comet tank and cab sides, the bunker rebuilt in plasticard, outside steam pipes and a top feed. Painting is in post-war NCC style, rather than UTA (albeit incorrect for 57: I must get round to renumbering this engine to the 1-10 series). The VS 4-4-0 is a Hornby Schools, with a new brass sheet cab and other modifications in plasticard. 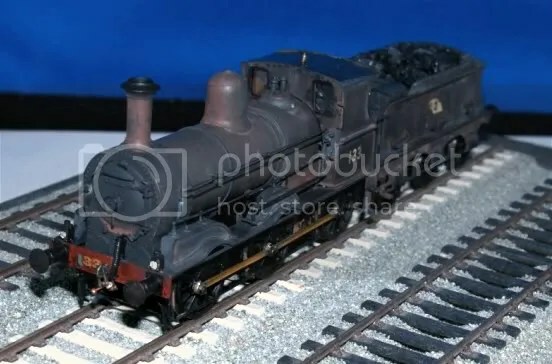 The GNR SG3 0-6-0 is a Mainline LMS Class 4 with a new brass sheet cab and firebox, and other alterations (particularly the tender) in plasticard. It needs a new dome with a rounder top. The GSR B1a 4-6-0 is a Mainline Royal Scot, with modifications in plasticard, and repositioning the dome. All are hand-painted – some better than others! As my main interest is in operation rather than precise modelling, they give an adequate effect at relatively minimal effort! Whilst most of my models are NCC (with a layout based on Coleraine and Portrush) some poetic license has allowed other railway’s trains to occasionally visit! Scenery will hopefully be improved once I retire and have a bit more time at home. It started out simply enough early in 2004. I saw the listing for a laminate brake standard on the Worsley Works web site and thinking it was a model of the 1958 brake composites, I bought the coach and a Deutz loco kit. I had been involved with the MRSI Loughrea group for many years and thought these models would give us a more accurate representation of the branch line in the “modern image era.” The only thing was that I was in the middle of planning a move to New Zealand! So the Deutz and coach have never had a trip on the Loughrea layout. The Deutz is essentially a complete loco kit without wheels motor, detail castings and turnings, the coach basically consists of sides ends and underframe, the builder has to source roof, bogies, interior, detail casting and bogies. While the Worsley Works coaches are basically similar in design to Comet, the main issue is in forming a roof as most Irish stock is wider than the British; Comet and MJT extrusions are too narrow. I model on 21mm gauge and while proprietary Commonwealth bogies might pass muster, I wanted the model to be as accurate as possible and bogies would require custom made side-frames. I was impressed with the detail of the coach and ordered an AEC railcar set, a Laminate second and a Park Royal coach: in for a penny, in for a pound. Basically the idea was to commission any special components required such as bogies, roof extrusions or pressings and detail parts from UK manufacturers, to complete my own models and test the potential market. Disappointingly, few of those I contacted responded or demonstrated a willingness to follow up on a serious enquiry for the design and manufacture of components to compete the project. I had experimented with forming the roof profile variously from brass, plasticard and balsawood without much success, there is little practical guidance on scratch building coaches or metalwork in the contemporary model press. Commissioning an extrusion locally was prohibitive. Eventually I followed Allen Doherty’s suggestion of using a proprietary extrusion as a basis for cutting and filling to a wider profile. Bogies are based on MJT torsion bar compensation units which are easily adaptable to the wider gauge, and other details are a mixture of Comet and MJT components. 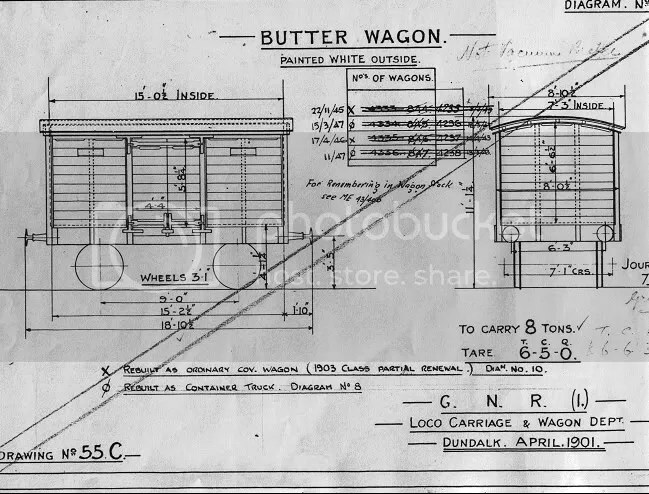 Unlike the relatively rapid development of the BR Mk.1 stock, Inchicore like the GWR in the 1930’s, seemed to have difficulty in building two batches of coaches to the same design and went through several stages of development before the arrival of the Craven stock in 1963. Briefly the 1953-4 period saw the introduction of a wide range of hauled stock based on a development of Bredin’s GSR flush sided timber framed designs, including open and compartment coaches, buffet, restaurant cars and mail vans. The earliest vehicles ran on GSR design bogies and traditional steel under-frames, later batches incorporated Bulleid triangulated under-frames and Commonwealth bogies. Even in the 1950’s such stock would have been expensive and labour intensive to produce and not readily adaptable to mass production, requiring a large highly skilled workforce to machine and assemble components. The Park Royals with their prefabricated components allowed volume construction using a semi-skilled workforce. Significantly though designed for suburban and main line use, only one design of body shell was produced. The laminates (aluminium, insulation, plywood panel) are best described as of modular construction with several body designs (based round a small number of components), again allowing rapid construction. There appear to have been at least four designs: a brake composite, 70 and 64 seat main line standards and a suburban coach. I recall laminate coaches being refurbished at Inchicore in the late 1970’s. Each coach was stripped down to roof, ends and under-frames, and re-skinned; either CIE still had a stock of body panels or the manufacturing capability existed. One theory was that it was originally planned to replace the bodies after 20 years, but this was no longer required following the introduction of monocoque design in the 1960’s. Inchicore appears have briefly reverted to timber frame body design for its final batch of twelve coaches (ten standards and two firsts) before the arrival of the Cravens in 1963. Significantly these coaches used the heavier BR pattern of Commonwealth bogie. The brake standard appears to be based on the 1970’s conversion of laminate coaches to brake standards rather than the 1958 brake composite design. The brake standards of this era were converted from laminate suburban stock and 1953-4 composites. The Worsley Works kit is of a different pattern and appears to be based on a conversion of a main line laminate standard. Two laminate brakes are preserved one the DCDR at Downpatrick, another by the RPSI as a service vehicle in their Dublin excursion train rake. The laminate standard and the Park Royal appear are to be accurate representations. The etchings make up in a similar manner to the Comet coach kits, with the body sides and ends designed to be removable from the chassis. There is a half etched representation of the joints between the body panels, a distinctive feature of the laminates. The chassis comprises a main floor etching, with fold down truss rods, with separate etchings for solebars and a lower body stiffener making up into a nice solid chassis. The solebars on the laminates and Park Royal coaches do not run parallel with the sides, the coaches running on Bulleid’s triangulated under-frames. 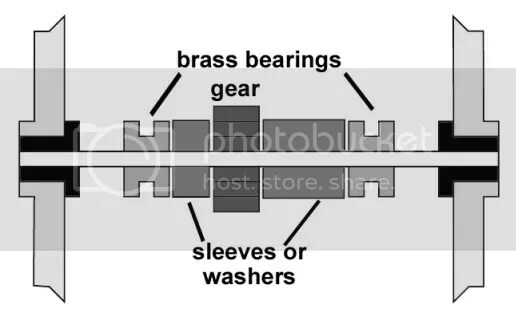 I have left well enough alone, though solebars, say from brass angle, could be set up in a jig to capture this subtle and distinctive feature of CIE stock of the era. The sides are easy enough to curve using brass bars and a straight edge. The Park Royal sides are etched in three sections with over lapping tags but are a bit flimsy being half etched. stream model press. The etched brass assembly is soldered, and the aluminium roof extrusion glued in place using cyno reinforced with epoxy resin, with a strip of plasticard to reinforce the joint between the two sections of aluminium and support the filler. In the end on Allen’s suggestion, I used a Comet BR Mk1 roof extrusion cut down the middle the gap filled with body filler. The roof detailing covers a multitude of sins and lifts the model. Comet torpedo ventilators and PC lining strip gives the roof its distinctive and jointed appearance. I decided to include a fairly high level of detail with door hinges, knobs, handles, toilet filler and communication cord pipe-work. 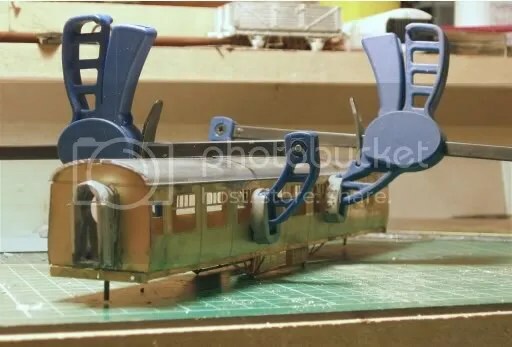 Next stage is pattern making and castings for bogie side-frames, dynamo and vacuum cylinders, heating and vacuum pipes, couplers, finish painting, build layout, couple up to B141! There is also a lot of useful information on building etched brass coaches like these on the Comet Kits website: http://www.cometmodels.co.uk/ Follow the links: Downloads Building Coaches the Comet Way. In the days when everything went by rail, some companies found it worth while building highly specialised vehicles for perishable traffics, which attracted premium rates, even if it meant those vehicles must have spent half their time running empty. 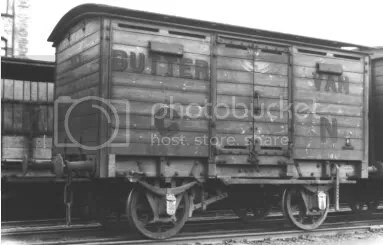 One such traffic was dairy produce, and the MGWR, GSWR and GNR all built special “butter vans.” In the era before electrical refrigeration, these vans employed various cooling mechanisms like double roofs and multiple small vents in the body, presumably to make full use of the draft when in motion. 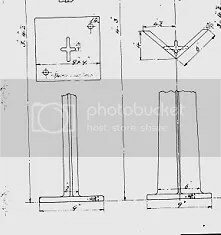 I have not seen detailed plans of the internal layout of these designs, but I am guessing that they may have been “double-layered” with ice between two skins of planking, or may have used some sort of system where the evaporation of water from a porous surface (as in the older type of terra cotta milk or wine cooler), by taking latent heat of vaporisation from its surroundings, could effect considerable cooling. I seem to recall a school physics experiment which demonstrated this phenomenon rather well. It involved bubbling air through ether in a copper beaker, the beaker sitting in a small pool of water on a wooden block. By the time all the ether had evaporated, the whole apparatus was so cold that the beaker was frozen to the block by a lump of ice! Alphagraphix now make a 7mm and possibly a 4mm kit for this vehicle. I am grateful to the IRRS archives and Mr Brendan Pender for access to the GNR drawing and permission to reproduce it. 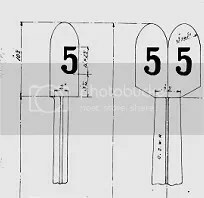 Irish railways used a number of methods to mark distances: the symbolic steel sheet squares, diamonds, triangles and arrow-heads of the MGWR were probably the most original design. Other companies used metal, stone or wooden markers. 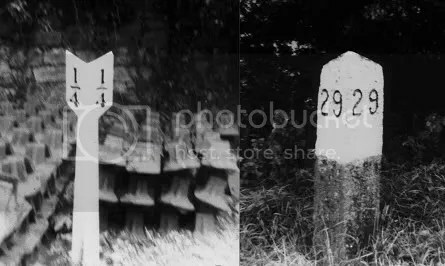 The GSWR used substantial granite mileposts on its original lines, but later, and on the absorbed WLWR routes, used the smaller cast iron patterns shown here. These diagrams come from drawing in the IRRS archives. I am grateful to the Society for permission to reproduce this and Brendan Pender for his help in accessing the archives.